Today was my second long bike ride of the season. Today’s ride was in the 25-30 mile range. I am purposely taking my old mountain style bike instead of my newer road bike on these first few rides. The old bike does not have the trip computer and therefore I am not subject to the tyranny of the numbers. How far and how fast. Later in the season I will want to chart progress. For now I just want to enjoy riding. I pass through some beautiful suburbs with large, expensive houses. I feel my pace and push where I can and glide where I must. It will take a half dozen more rides at least before the body starts responding as I want it to. Unfortunately this is a heavy travel week. Eight plane rides between Monday morning and Thursday. Also, I will be out of town this coming weekend. The following weekend is Mother’s day so I will need to adjust and ride on Saturday. I hate to miss ride days especially early in the season. At the end of September is the local century ride. Last year in my first attempt I completed 85 mile but my legs were dead and finishing was not an option. This year I will train enough so that I will be asking for more after the first 100. I am sure that there are many scientific studies of the impact of sunshine on a person’s attitudes toward life. I am someone who takes interest in reading those studies when they present themselves. However, I will rarely seek them out. Especially when the correlation is easy to observe. The weather in Chicago has literally been hot and cold. Certainly on consecutive weeks sometimes on consecutive days. Today was sunny and in the 80s. People were on the streets, the lines at the ice cream stores went out the doors and smiles abounded. Chicago is beautiful, for a city, on days like these. You can’t help but be happy. Awhile ago when I was lamenting that I was not having fun, I committed to listing what I liked to do and want to learn to do. Here they are. More to come as I sort this out. I rarely think about bees except in August when they start appearing in droves and make going to the beach or having a picnic a miserable experience. Or when “killer ” bees were making their way north from Mexico. Or when I am putting honey in my tea or better yet trying to substitute honey for sugar in a cookie recipe– an amusing story in its own right. Ask me some time. So who would have thought that honeybee raising was an industry and that in addition to honey the bees play a material role in cross pollinating crops the world over. Why am I so enlightened now you ask? Because the case of the missing bees has become a major news story. We are not talking about the occasional kidnapping for ransom of the queen bee. Hives are beeing found empty in colonies across Europe, Asia and North America. This has become such a crisis that it has its own acronym–CCD for Colony Collapse Disorder. Give me a break. CCD conjures up images of a bee on a couch buzzing to a psychologist about how hard life is as a drone! Can’t the scientist just say the bees are gone? Too “plain English”. Cause is yet unknown. The current suspects are Nosema ceranae (a fungus), pesticides and cell phone tower radiation. I say we get them in a police line up and have the few remaining bees identify the guilty party. The worst thing in all of this is losing bees is not really funny. It could substantially reduce crop yields. And I thought all I had to worry about was global warming. PS. I am having a contest for the best bee related title for this story. I thought about a couple of dozen possibilities and Bee Gone was the best of the lot. The best suggestion wins a post written about the comic genius of the author. I found out today that S is in intensive care after falling, hitting her head and causing the type of internal bleeding usually reserved for TV medical dramas. But this is not TV, this is real and happening to someone I care about. So my prayers are with her tonight. I do not pray often so I assume that G-d knows that I am serious and that I am asking for help. I pray S gets well quickly and back to her normal; which puts most of our normals to shame. I was thinking of something to send to cheer her up. What she likes most are stylish clothes, shoes and handbags. Unfortunately, style is not in my repertoire. I may need to stick with flowers. First of the spring. 20 miles, easy pace. Muscles ached, short of breadth. Normal first time reactions after a long Chicago winter. Beautiful day. Sunny, 70s, light wind. It was grand. Four years ago I rediscovered biking as an activity. It has become a major part of what I do and who I am. I missed it. I do not like stationary bikes or biking in frozen weather so I give it up for the winter. I feel the beginning of rejuvenation. This is the summer I complete my first century ride. Did not even mind being passed. At least not by the first two riders. Young and on expensive racing bikes. The third person was at least 10 years older and on as basic of a bike as it gets. That stung for a moment. But could not take the joy out of Ride #1. I flew 5000 miles this week. It is virtually impossible to do that and have nothing go wrong. I did not achieve the impossible. Having said that, it could have been worse and this post’s title could have been more dramatic. A couple of quick stories showing that even airlines have multi-faceted personalities, though upon further reflection, it is more Dr. Jekyll and Mr. Hyde (or sometimes Heckle and Jeckle). Tuesday. I finish early at my client and am able to return home this night instead of Wednesday if the airline gods will bless me. Mixed blessing. The flight I want out of a small Tennessee town has been canceled but there is one last flight that will allow me to make a connection and sleep in my own bed tonight next to my own wife. The Catch. I am flying on a non refundable ticket which means standby, the airline can be benevolent or I may have to pay a modest fee. I am OK with any of these. The Mr. Hyde part. It takes 1 hour and 20 minutes for the new computer system at US Air to take my $100 and get me confirmed on flights. The Dr. Jekyll part. Brenda at the US Air counter stayed on this and would not quit until she could get me what I needed. Thank you Brenda. Home at midnight but home. Wednesday I show up at O’Hare needing to get to beautiful Billings, Montana. I was scheduled to connect through Denver in time to have dinner with my client. To my surprise the check-in kiosk tells me I cannot get there today. I am automatically rebooked on flights tomorrow. You can almost see the kiosk smiling knowing that it has done its job. Problem is that this is a one day meeting and I am heading back the next day. The Dr. Jekyll part. Two United agents work hard and eventually find a way on Delta through Salt lake City to Billings. They tell me I am confirmed and I race to the Delta counter where more mayhem awaits. The Mr. Hyde part. The Delta ticket agent informs me that I am not confirmed but on standby. The good news is that the flight to Salt Lake is wide open. HOWEVER, the flight to Billings may be oversold and that I will not know until I am in Salt Lake City. Being stuck in Utah is worse for me than not going at all since my return ticket is still through Denver. 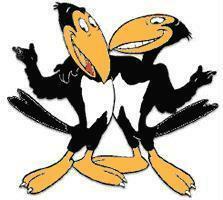 An hour later at the Delta gate the Heckle and Jeckle part ensues. The first agent tells me that the flight to Billings is oversold. Being a savvy traveler I am not satisfied with that answer so I ask if I am one of the people who has a confirmed seat. He looks confused. The person working next to him looks at my ticket, types in a few things and gives me my seat assignment for this flight and a confirmed seat for the flight to Billings. Anxiety gone. I get to fly into SLC which is beautiful. I save the day at my Friday meeting, catch a tight connection in Denver and am home at 10:30 instead of the scheduled midnight. Firmly in travel heck. PS. I flew a Boeing 777 home from Denver. Fantastic plane. Running Hard Just To Get Away. Gone.